A tour to Australia which was formerly planned is now uncertain, and for the Asian Games silver medalists, there are no major tournaments scheduled for this calendar year as the FIH has not sent India an invite for the Champions Trophy. The Japanese girls who upset the Indian eves to claim their maiden gold at Jakarta will instead travel to China to take part in the final edition of the prestigious tournament. For the Golden Girls, it is time to reflect and retrospect on what has truly been a memorable, momentous, and busy season. The rigors of playing in a huge tournament like the London World Cup followed immediately by the Asian Games took a huge toll on the eighteen players who made the most of a break post the Jakarta event. Savita Punia whose heroics in the Asia Cup final ensured that India earned a ticket to London, was unable to get her team over the line in the World Cup quarterfinal shootout against Ireland, especially since the Indian strikers failed to get past her Irish counterpart, Ayeisha McFerran. "We failed to play attacking hockey during the shootout against the Irish. We should have won the match in regulation time and not taken it to the shootout stage - having said that, as a team, we have had a good record in shootouts as well." "The coach (Sjoerd Marijne) wanted us to play the way we did against England and the USA but on the day we failed to execute our plans on the pitch. The players were a bit nervous, perhaps, and made mistakes, but we learned a lot from the World Cup." 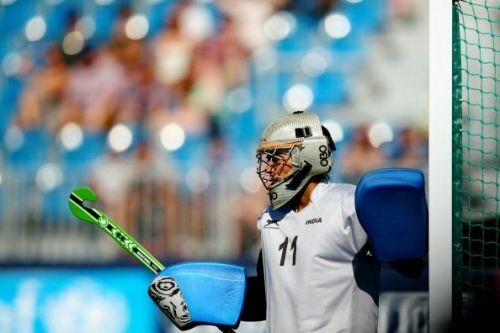 As India's champion goalkeeper explained to Sportskeeda in an exclusive interview, notwithstanding the massive disappointment at London, there was little time to wallow in self-pity as the girls had to prepare for another battle with Olympic qualification in mind. "In spite of the fact that we were distraught, there was no time to dwell on the quarterfinal loss at length as we had to prepare ourselves mentally for the Asian Games." "Winning a silver medal after a gap of 20 years was indeed remarkable"
Sjoerd Marijne's team did just about everything right at Jakarta but were unable to overcome a determined Japanese side in the final. What was noteworthy despite the loss was the fact that Rani Rampal and co. did manage a podium finish - an achievement which their predecessors failed to accomplish since 1998. "The Asian Games final was a very close encounter and we played good attacking hockey. Our aim was always to win the gold and qualify for the Olympics right away," says the Haryana girl as she recalls the bitter-sweet memories. "We were naturally upset that we failed to achieve our objective but the coaches and all the players consoled each other and we did realize eventually that winning a silver medal after a gap of 20 years was indeed remarkable." So, did Savita manage to recharge, recuperate, and spend time with her family post the Asian Games? "Yes, it was indeed a relaxing experience to go home and spend time with my parents without worrying about diet restrictions, waking up early, and training." "We do not have any tournaments coming up in the next two or three months, so going home after the Asian Games and showing the silver medal to my parents was a wonderful experience." "It was a proud moment for them and the look in their eyes conveyed the kind of happiness and satisfaction that words cannot express." Indeed, the joy was doubled by the fact that Savita was also the proud recipient of the Arjuna award which she received last month. "It is a matter of great pride for any sportsperson in this country to be chosen for the Arjuna award. My teammates were happy for me and I feel the award belongs to all of them. It is also satisfying that I got the award the very first time I applied for it." Yet, a job is what remains as elusive as ever for Savita in spite of repeated requests from her end, and there is now a sense of deep dismay which seems to have crept in as we found out when we sought to get an update on the current status of her application. "I simply do not have any major expectation from the Haryana Government any longer"
"I never received any assurance to this effect (with regard to a job) from the Haryana Government. The only person who has assured me repeatedly in this regard is Rathore Sir (Rajyavardhan SIngh Rathore). I have met him personally in the past and recently as well and he is the one who has stood by me." "The Haryana Government has reacted neither to my job request nor to my Asian Games silver medal or, for that matter, to my Arjuna award. I simply do not have any major expectation from the Haryana Government any longer." "Maybe they wanted the team to win a gold and not a silver medal but I have not heard from them. It is a well-known fact that I applied for a job last year and I am sure they are quite aware of this." "My father had earlier told me to be patient and wait for a response from the Haryana Government, but now even he concurs with my view that I should apply online on my own. My hopes rest only on the Central Government for now." So, does India's champion goalkeeper believe that getting an Arjuna award is easier than getting a job in this country? "Well, an Arjuna Award is something one gets after striving for years - some people told me that I got the award late, but nevertheless I do cherish it all the same. A job is a basic requirement and ensures that a sportsperson can perform well on the field. A lot of changes are currently happening in Indian sport and I wish some changes happen in this regard also." It is truly distressing and utterly lamentable that one of the best Indian custodians of all time, who has stood steadfastly under the bar for flag and country, is having to beseech and implore the concerned officials to enable her to acquire something as fundamental as employment. Will the authorities finally pay heed?